In March of 1863, Frank James of East Texas, left home and joined Company H, 7th Texas Infantry. His service in the Confederate Army was brief. Two months after enlisting, James died from a wound he received during the Battle of Raymond. On the day of the battle, May 12, 1863, James was one out of 2,500 Confederate soldiers who squared off against a Union Army of 10,000 men. Following the battle, the Confederates tallied their loss at 514 men. Initially, James was listed as "wounded in action ". However, a month later he succumbed to blood poisoning. Frank James was not a military man nor did he hold high military status. He was simply a family man who enlisted to fight for the Confederate cause. His brother, also a Confederate soldier, was stationed in Vicksburg. Following the news of Frank James' death, his brother wrote the family back in Texas to relate the devastating news. The letter was dated June 21, 1863 and postmarked Vicksburg. "Dear Mother, It has become my painful duty to announce to you and relatives the death of Frank. It is not necessary for me to undertake to give you the particulars and circumstances connected with his death. Dr. Johnson can tell you all you wish to know as he was with him several times, waited on him, and took great interest in his case. He did all he could for him, but he had been neglected too long when he got to where he was. I did not get to see him at all. "When we first came down from Tennessee I heard that he was wounded but very slightly. I gave myself no uneasiness about him (as the doctors and others brought news that the wounds were doing well), until Dr. Johnson came to where we were some 30-miles from where Frank was. I could not get off to see him as I had no assistant, and had orders not to leave the command at any time as we were expecting a battle every day. Dr. Johnson can tell you all you want to know. He has shown himself a true friend to Frank, and spared no pains in rendering him comfort. I know this will be sad news to you and the children as I assure you it was to me. "We have all to regret, Frank has proven himself a parent and friend to us all, and his place can never be filled with us. More than all which should be a consolation to us and his children, is he died as few men die, without an enemy on earth. These are grateful reflections, but that aching void can never be filled. We are doomed to mourn his death as children, mother, stepchildren and relatives. We have lost our dearest and best friend, one whom we loved dearly. I cannot dwell: my heart seems to melt in spite of me when I think of him and his kindness, and his affections toward us all, but he is gone now - though we should not forget to pay him tribute, and cherish the memory of him as an example. We should not forget that we must prepare to live till our time comes, and try to die as he died, having nothing in past life to regret. Then bear these troubles as well as you can for his sake, that we may take the better care and raise those little boys of his right. This we can and will do for his sake." Frank James died on June 14th, 1863. Some months later, in October of 1863, his death notice appeared in a Marshall, Texas, newspaper. The fate of the Confederate soldier was resurrected in 1916 when his son, W.L. James, reprinted the obituary in the Abilene Morning newspaper. 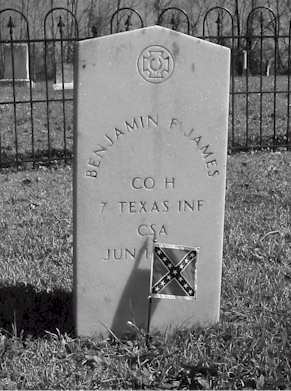 Some years later, on May 12, 1963, at a dedication ceremony in the Confederate Cemetery of Raymond, James was one of the soldiers who received a marked tombstone. Frank James was no longer marked as an "Unknown Soldier". Excerpts from Frank James' obituary revealed that he died from a wound to the thigh. The obituary also revealed that he was almost 41 years old at the time of his death. As to his character, the obituary stated, "Another good man was sacrificed on the altar of his country. Perhaps no man had fewer enemies, and was more highly esteemed by all who knew him, as an honest, correct and good man, than Frank James, and this was especially true in his family and among his relations." He was described as, "A Christian patriot, a soldier in the Confederate army, a defender of southern rights, and a martyr to the cause of our independence." Nostalgically, the obituary concluded by stating, "Although Frank James remains lie buried in some distant battlefield away from home, where his dust mingles with the slain in a hard fought battle, yet his name lives in the memory of grateful people and as a husband and father was loved and revered, and as an example will be a beacon light to direct the footsteps of his growing offspring."